The Nerd Much? 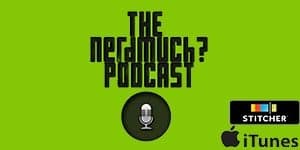 Podcast - Episode 5: Switch and Zelda, Does Anything Else Matter? | Nerd Much? Those of you who have been following our new podcast venture might have noticed that we didn’t release an episode last week. So if you’re wondering why, it’s simply because Liz and I were both under the influence of what could only be described as the plague. But now that we’re feeling much better, we’re back with an all-new episode. In this week’s episode of the Nerd Much? Podcast, we’re talking solely about the Nintendo Switch — our thoughts on both the hardware, its games, and what we think the pros and cons are so far. We also delve into what we’re looking forward to in the next year from Nintendo’s newest console. So check it out below, or fire up your favorite podcast listening app (we’re on iTunes, Stitcher, PlayerFM, Tunein, and more) and hang out with us for 45 minutes as we chat about the Switch. Also, fear not if you are not interested in the Switch, as next week, we’ll return to form with a more normal episode focused on the latest news and happenings in the wonderful world of nerd culture.